The April sky layers the cold, white stuff onto my life and maybe assumes I didn’t get the message with the first couple of inches, because here comes more to drive the point home: There’s nothing outside for you to do. Deal with your baggage. It’s literal baggage this time, and I know right where it is. I descend to the basement where the years are snapped away behind plastic bins I said I’d deal with later. And ‘later’ stares at me now. Of all the containers, there’s one I can’t face. It holds history and smells like the years and the struggles of immigrants—and my guilt of stowing it away for so long. But its contents are too rich to flaunt, too delicate to display, too precious to use, and let’s face it: I’ve never lived in a museum house. We’re always taught things go away, but people last for eternity. As I peel back the tote’s lid, though, I only see the opposite: Grandma Dyrud is gone, but her possessions remain. 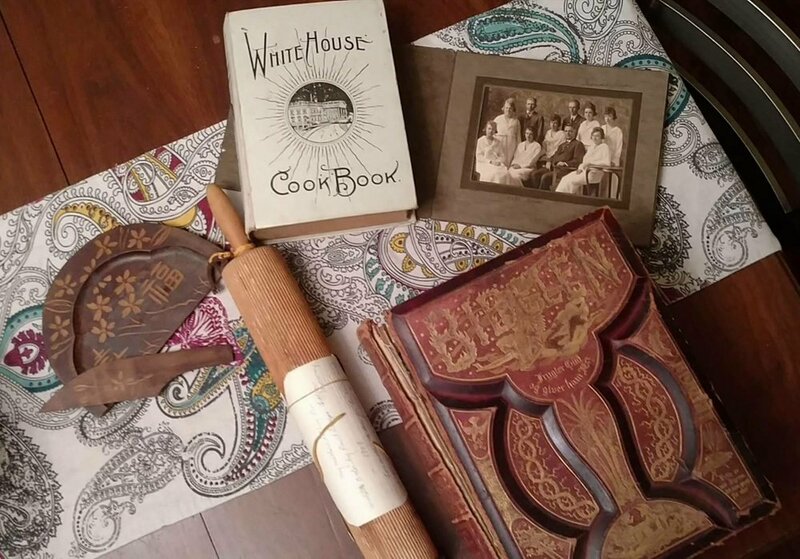 I sift through the contents again: a Bible in Norwegian, measuring five inches thick and pushing eighteen pounds; a rolling pin made in Fitjar, Norway, in 1909 for Great-grandma’s new life in America; a confirmation portrait of Grandpa’s sister; a wooden cheese board and knife; the White House Cook Book, published in 1911, with newspaper clippings and a pamphlet of wartime recipes tucked into its pages. When Grandma handed me these antiques in the early nineties, she hoped I would share them with my future children. But Grandma’s world was durable, and my girls’ world is disposable. The Bible is portable now. I have a new rolling pin, dishwasher-safe cutting boards, and sharp knives. And my girls don’t need recipes geared toward conserving flour, butter, sugar, and eggs. I replace the lid on the box. I’ll phone some relatives today. Someone will want to learn something new while holding something old. Someone will want to breathe in history and imagine a young woman and her rolling pin in a boat, sailing across the ocean for America. Someone new will turn the relics back into treasures.